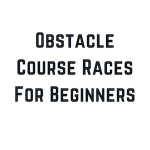 All inclusive guide to obstacle course racing. One trend in OCR is the high-mileage, 24-hour, endurance fests that you’ll see across every OCR race series. The other big trend that is catching on in 2018 is ultra-short distance races like Tough Mudder X. For these types of races, it takes a different skill set to find the podium. 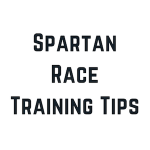 While endurance is still important, you have to develop more strength-based skills that can also help you in other OCR events like Spartan Race and Rugged Maniac. The best ways to train for Tough Mudder X involve mixing strength, power, and endurance moves into your schedule. There are lots of ways to train for Tough Mudder X. Some training methods include building muscle through bodyweight workouts, while others will have you performing olympic-style weight lifting moves like thrusters and power cleans. You can train like Hunter McIntyre in California by dragging boulders up mountains, or you can do something that is a little more practical for your lifestyle. Below, we list our five best techniques for ways to train for Tough Mudder X. This exercise is great because it involves two very different movements that incorporate two different muscle groups. 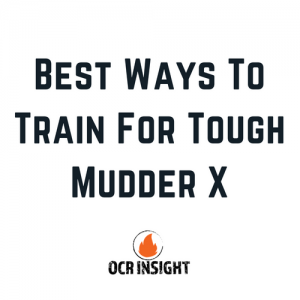 When you’re looking for the best ways to Tough Mudder X, you will want to be working many different muscle groups at once, so you need to get comfortable feeling fatigued but still powering through whatever is in front of you. How to do: Begin by standing in front of pull up bar. First, perform burpee by quickly squatting down and kicking feet out behind you so that you are in a pushup position. Lower body so that chest touches the ground, then hop your feet to chest and getting into a crouching position. From crouching position, jump up and grab pull up bar. If using a door frame pull up bar, simply hop to feet from crouching position, and carefully grab pull up bar. Immediately perform one pull up with palms facing away from body. After performing one pull up, release back to standing position. This is one rep. Try This: Perform as many reps as you can in 5 minutes. Keep a log and see how quickly you can improve. Then, build to see how many you can do in 10-15-30 minutes and keep track. Here, you’ll be building every muscle group in your lower body. From your quads and calves to your hips and glutes, everything will be on fire when you perform this workout. Leg stamina and power are key to finding the best ways to train for Tough Mudder X, and you’ll want to make sure you are ready to go on race day. How to do: There are a total of five movements that you’ll do. If you are using a track, you will perform two exercises for every 400m (one lap around the track). You’ll alternate each of the two exercises every 100m (so you’ll do each exercise twice each time around the track). If you’re using cones, perform each exercise from one cone to the next, then alternate as you run back. While it would be nice to use nothing but body weight for ways to train for Tough Mudder X, when it comes to building strength and building strength quickly, you need to find some basic weights. You can use a gym, or build you own home gym, but you’ll need a few key pieces of equipment in order to perform this strength circuit. How to do: In the Crossfit world, a lot of circuit exercises are done in what is called an “AMRAP,” which stands for “As Many Reps As Possible.” You’ll want to set a watch timer to 15 minutes, and perform as many reps, in order, as possible in that timeframe. Please note: the importance of good form on any exercises, especially those with weights, cannot be understated. While the goal is to progress through the movements quickly, sacrificing form is a recipe for injury. Try This: For this strength circuit, you’ll be performing deadlifts. While a deadlift might look simple, good form is key. For this workout, find a weight that is comfortable for you (typically start with body weight, and adjust higher or lower as needed). Since you’ll be doing circuit work and AMRAP, you should find a weight that is heavy, but not extremely taxing as you’ll be performing many series of lifts. If you mix those three workouts in with endurance training, stretching, and rest days, you have everything it takes to conquer Tough Mudder X. Tough Mudder X is a great test of power, endurance, and strength, and these 3 training tips to conquer Tough Mudder X will get you ahead of the game and in position to find success! 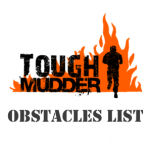 Tough Mudder Obstacles List: The Top 10 You’ll Face in 2018! Obstacle course racing (OCR) is the newest and best way to test your endurance and strength. You can now find an obstacle course race in every major city almost every month of the year! 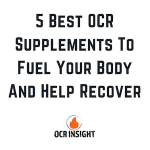 Looking to make your OCR experience the best? We do the research for you. From what shoes to wear to which race will challenge you the most, OCR Insight is your one stop site for all things obstacle course racing.